After working over 30 years in corporate America and rendering public service in a state government agency, I am finally where I belong—the Prayer Room. Although it is not a popular place, nor is it a public meeting place, it is the perfect place for me simply because by nature I am a private person. As an only child, I adjusted quickly to solitude and I learned to embrace silence. The Prayer Room is the place designated to pray; the supernatural is welcomed to invade the natural, which results in spiritual transformation. Change is not always visible to the naked eye, yet there are moments when obvious change has taken place beyond our finite comprehension. I am so thankful that purpose pursued me! I am at peace in this place of prayer, where God’s presence penetrates the core of my being, invades my heart and pure worship captivates my soul. I have been summoned to this place for purpose. My journey to this place was destined by God before the foundations of the world. It is being in this place that I am convinced of my call to prayer and intercession. More importantly, I am humbled to be entrusted with serving my King and partnering with Him in Kingdom assignment. Father, I come boldly to your throne of Grace, in Jesus’ Name on behalf of those who need employment. I believe and confess your Word over them today knowing that you watch over your Word to perform it in our lives, and that it is your will that your Word is manifested in the earth realm. I pray that your Word prospers wherever it is sent! And I send it to those needing employment. Father, I acknowledge that You are the Source of all our needs; it is because of You that we have the resources needed in this life. You are the Source of every need, consolation, comfort and encouragement. I pray that believers who seek employment are courageous and grows in strength, not becoming discouraged and giving up in their search for gainful employment. You know every need and You are concerned about our well-being. I pray that you will instruct them and guide their path as they acknowledge you. I pray that even their search for employment, they are drawn closer to You as they pray asking for Your help and committing their way to Yours. Father, I thank you that you have already set before them an open door, which no one is able to shut. Lead them to that open door that they may enter in. Father I pray that your favor surrounds them like a shield. Help them to have perfect peace and confidence in your faithfulness to provide and protect. I pray that they be of good cheer because Jesus has overcome the world, and deprived it of its power to harm them. I pray that those seeking employment will not fret or have anxiety about their situation, for your peace, Lord, mounts guard over their heart and mind. I pray that they realize that even in this situation they are self-sufficient in Christ’s sufficiency. Your grace is sufficient. Let them speak your word over their situation in faith. Father, again I ask that you direct, make straight and plain their path. I pray this prayer on their behalf and in agreement with Your will, personal plan and purpose for their life. Thank you, Father, that You hear us and answer. Amen! Knowing that Jesus knows how you feel should change your perspective. At least, it changes my perspective on everything. It gives me reason to persist in prayer. Emotional pain. He experienced grief, anger and agony. He knows how it hurts to be mocked, ridiculed, falsely accused. Relational pain. He experienced rejection and betrayal. Those he had walked with for three or more years deserted Him in the hour they should have stood in support of Him. After all, they were eye-witnesses to His compassion and care for them and the multitudes He ministered to. Yet, they denied their relationship to Him and ran away leaving Him alone. Physical pain. He experienced physical pain. Can you imagine being beaten as if tenderizing meat before cooking it? Or the blood that streamed and splattered after each pulverizing blow? 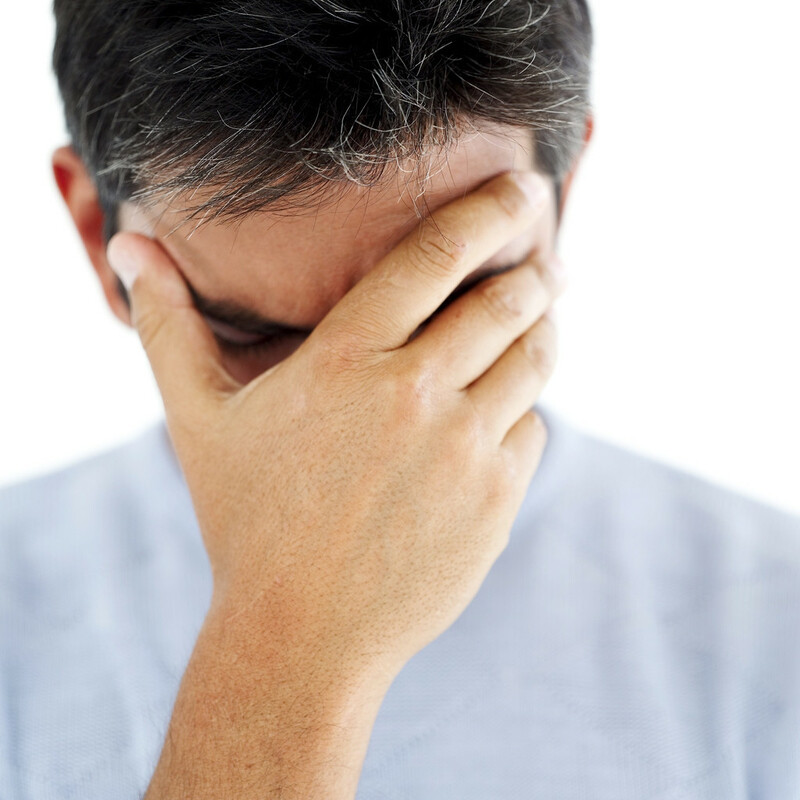 Can you image the severe pain when a crown of thorns was placed on His head? It was a flinching reaction for me just watching the Roman soldiers, who were experts at beating a man. But this was not just any man; this Man was innocent! He had committed no sin or did no wrong. This was Jesus, the Beloved Son of God, being beaten. His body was being crushed so that we can be healed and whole! His blood was shed so that we could be forgiven and cleansed from sin. It was an emotional moment as I watched the blood splatter and the soldiers gasping for breath because they were exhausted from beating this innocent Man unmercifully. Then my perspective changed when realized it should have been me. This realization birthed in me eternal gratitude, which will always be expressed in my prayer: “Thank You, Lord for suffering in my place!” I am so grateful that we don’t have a High Priest who is out of touch with our reality. He’s been through weakness and testing, experienced it all—all but the sin. So in prayer I will always walk right up to him and get what he is so ready to give. Take the mercy, accept the help. We can only give a pattern to follow, principles and guidelines from God’s Word to prepare and equip you for a life of prayer. In Luke 11:1, the disciples asked Jesus, ‘Lord, teach us to pray…’ Jesus gave them a model or pattern to follow. He established principles and guidelines to help them gain a new perspective on the Kingdom of Heaven and their approach to a relational God who desires to have a parent-child relationship with those who belong to Christ. These same principles are applicable for us today. It is about relationship. Now I lay me down to sleep, I pray the Lord my soul to keep. May God guard me through the night And wake me with the morning light. Amen. Hopefully, no adult that has accepted Jesus Christ as Savior and Lord is still praying the above prayer. The idea is as we grow in age and spirituality, being in relationship with Christ, our prayers change as our level of understanding increases. Basically, as we become spiritually mature Christians, our conversation with the Father (prayer) should reflect our maturity as well as our level of commitment to Christ. Moreover, when our personal faith in God increases, and we grow in the knowledge of God through experiences, we learn how to pray through the power of the Holy Spirit–the Spirit of Truth. Yet, we must follow the pattern, apply the principles and become habitual in the practice of prayer in order to be consistent in our learning experience. Sure, no one can actually teach another person exactly how to pray because it is personal dialog with God. However, we learn to pray as we grow in our relationship to the Father and His Son, Jesus Christ through the practice of prayer. It is easy to be identified as having a longing soul especially during times of grief, the holiday season and other events that can cause frustration and unfulfilled needs. This can become an entrapment that makes life seem unbearable. Usually the longing soul focuses on self-gratifying things, things of a temporal nature, compatible companionship and camaraderie, which cannot bring long-lasting satisfaction to a longing soul. Signs of a “longing” soul are running about, rushing and running to and fro, eager or greedy, thirsty, and yearning for more. The search for fulfillment is usually in temporal things that depreciate in value, or running to that individual you hope will satisfy the need you have to feel loved and secure. Unfortunately, none of these will satisfy the longing soul. The depth of the longing soul is beyond our comprehension and certainly greater than what we perceive as our greatest need. God never meant for another human being to take His place; to satisfy that part of us designed for Him. The longing soul can only be satisfied by the One who created it, breathed life into it–the Giver and Sustainer of life. Truth is we can experience temporary and short-term satisfaction, but only God can give complete, long lasting, eternal satisfaction. Sometimes we think we know what we are longing for, but more than likely, we really do not know. All we know is that something is missing–there is a deep void within, an emptiness that screams to be filled like a hungry infant at feeding time. Let me assure you that God knows what you’re longing for even if you do not. After all, He created you and He knows all things about you. He wants to fill your soul with Himself through the “life-giving” Spirit. Let us pray! Father, You are Creator of the Universe, which is beyond our comprehension; yet You are so concerned about all mankind that you have a plan to implant Yourself in us that we can live eternally. This too is beyond our comprehension; so it is by faith that we accept Your plan. Father, I pray for those who are searching, running to and fro, thirsty for fulfillment that only comes from You. Your word in Psalm 107:9 declares that You satisfies the longing soul. Father, I pray for those who are unfulfilled, looking to people and temporal things to satisfy and meet a need that You want to meet. I pray for those who are desperate for companionship, and overwhelmed by life’s challenges. Lord, I pray that they invite you into their heart so that You can satisfy their thirsty soul. Only through an intimate relationship with You can we enjoy the abundant life that comes through faith in Your Son, Jesus Christ. Father, our faith is in You; You are faithful to keep Your Word. Thank You, Father, for satisfying the longing (thirsty); in Jesus’ Name we pray. Amen. PRAYER: A Call for Help! King Jehoshaphat’s Prayer, 2 Chronicles 20:1-12 (The Complete Jewish Bible, Copyright © 1998 by David H. Stern. All rights reserved.) I suggest reading the entire 20th chapter. Focal point: When it God’s plan the battle is not yours! This chapter is one of my favorites! King Jehoshaphat made a bad decision allying himself with King Ahab, but God delivered him from the Syrian captains when he cried out for help (18:28-32). After his rescue, he was challenged by Jehu to do the good that was in his heart. King Jehoshaphat had prepared his heart to seek God (that is key, 19:3). He led a reformation to turn the people back to God. He gave instructions to the judges he set in place to administer justice. His instructions were very clear: “Take heed to what you are doing for you do not judge for man but for the Lord, who is with you in the judgment.” Note*** this country would be more peaceful if these instructions were heeded today! In essence, you could say, reform began with the judiciary system (19:6-11). What can we observe and learn from King Jehoshaphat’s prayer when petitioning God for help? He acknowledges LORD (ADONAI) JEHOVAH (“the existing One”, the proper name of the one true God). He acknowledges Him as God of our fathers, which establishes his ancestry connection, and covenant relationship. He acknowledges God’s positional authority, Sovereignty, rule over all kingdoms and nations, and His being all-powerful (omnipotence). None can withstand the one true living God! Fulfilled His promise by giving the land to Abraham’s descendants forever. A sanctuary, God’s dwelling place; a centralized location for His chosen people to worship Him. He recalls King Solomon’s prayer at the dedication of the Temple. He repeats the words of the prayer (2 Chronicles 6:20, 28-30) before God and the people hears the words as well, which included a request for God to rescue them if they’re in distress and cry out for help. ***PRAY GOD’S WORD!!! He calls out the names of the enemies that have risen against them. He seemingly “blames” God; HOWEVER what he does is points out the children of Israel’s obedience to God; God would not allow Israel to destroy when they were delivered from Egypt. Jehoshaphat petitions God to execute judgment; punish those that coming to fight against them (verses 12, 13). He unashamedly declares they’re looking to God (our eyes are upon You), as all of Judah i.e., their household and families looked in expectation for God to intervene. Needless to say, God sent a word in response to the king’s petition for help (verses 14-17). God always has a plan and will execute His plan in our defense to fulfill His purpose. However we should acknowledge who He is, His greatness, power and recall past demonstrations of His power, whether in His written Word or in our personal life. 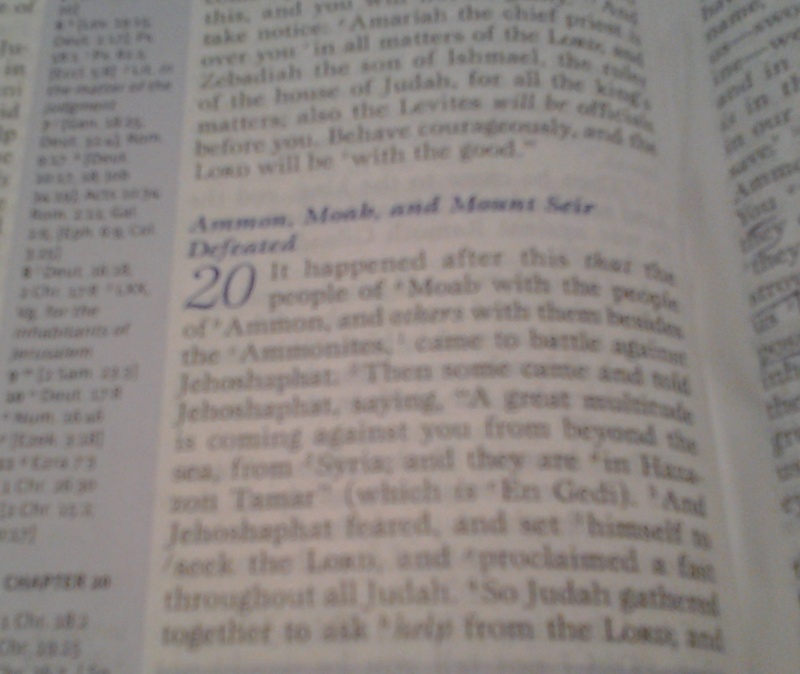 As Jehoshaphat, we must admit we need His help and expect Him to respond to our cry for help. Not only that, but follow His instructions that will defeat the enemy. **PRAISE is a weapon! (c) 2014 Queen E. Phillips. All rights reserved. 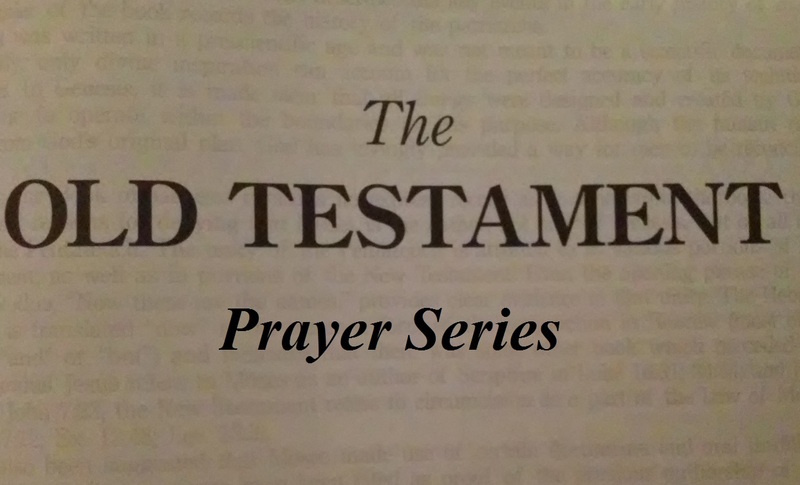 Let’s consider Jeremiah’s prayer within the context of Chapter thirty-two. 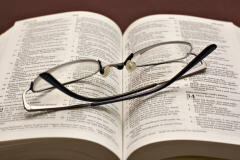 Focal point: Obedience to God’s instructions when they seem irrational to human understanding. Jeremiah was imprisoned in the courtyard of the guard in the royal palace of King Zedekiah (32:1-2). He was imprisoned because of his obedience to God’s command to prophesy the destruction of Jerusalem by the Babylonians, and that the people would be carried off into captivity, including the king (vs. 3-5). Here are the questions based on human rationale: If Jerusalem will be destroyed and the people carried away, what sense does it make to purchase land? Why buy worthless land? Nevertheless, Jeremiah was obedient to what the LORD instructed; he bought the land and put the title deeds in a clay jar (vs. 6-13). WORTH NOTING is that although God commands/instructs us to do something irrational to us, He always has a purpose for what He instructs us to do. Also, because He is sovereign, He may not or may tell us His purpose, as He did with Jeremiah. The reason Jeremiah was instructed to buy the land, and preserve the title deeds in a pottery jar was to signify that someday all the land of Judah, worthless at the time because of Babylonian invasion, would once again become valuable, would be bought and be occupied by God’s chosen people. In essence, buying the land was a “prophetic act” of faith in the sovereignty of God and the truth of His word. Although Jeremiah’s instructions were private, his actions were public. No doubt, the act of symbolism was senseless to the people; yet, the prophet obeyed. There is a trendy saying now, “Just do it.” Let me encourage you, “just do it”–just do what God says. Additionally, when you obey God’s instructions regardless of how illogical they may seem, acknowledge His sovereignty. Since God is sovereign, you can trust Him to work all things according to the counsel of His will and good pleasure. 17 “O Sovereign Lord! You made the heavens and earth by your strong hand and powerful arm. Nothing is too hard for you! 18 You show unfailing love to thousands, but you also bring the consequences of one generation’s sin upon the next. You are the great and powerful God, the Lord of Heaven’s Armies. 19 You have all wisdom and do great and mighty miracles. You see the conduct of all people, and you give them what they deserve. 20 You performed miraculous signs and wonders in the land of Egypt—things still remembered to this day! And you have continued to do great miracles in Israel and all around the world. You have made your name famous to this day. 21 “You brought Israel out of Egypt with mighty signs and wonders, with a strong hand and powerful arm, and with overwhelming terror. 22 You gave the people of Israel this land that you had promised their ancestors long before—a land flowing with milk and honey. 23 Our ancestors came and conquered it and lived in it, but they refused to obey you or follow your word. They have not done anything you commanded. That is why you have sent this terrible disaster upon them. In the end, what God promises will come to pass! Do you believe this? Can we acknowledge God’s sovereignty by being obedient to His irrational instructions? Are we at a point in our relationship with God that if He instructs us to do something irrational and does not tell us why, will we be obedient?